It seems the truth may lie behind the scenes. FOX has released a new behind-the-scenes promo for the 11th season of The X-Files. The new video features stars Gillian Anderson and David Duchovny, as well as creator Chris Carter. The trio sets up the coming installment, as they address the massive cliffhanger that was the season 10 finale. The X-Files season 11 premieres on Wednesday, January 3, 2018 at 8:00pm ET/PT. A sci-fi mystery thriller which originally ran on FOX between 1993 and 2002, The X-Files stars Duchovny as FBI Special Agent Fox Mulder and Anderson as FBI Special Agent Dana Scully. Returning in season 11 are Mitch Pileggi, William B. Davis, Annabeth Gish, Lauren Ambrose, Robbie Amell, Veronica Cartwright, Chris Owens, and Dean Haglund. New players include Barbara Hershey and Haley Joel Osment. THE X-FILES originally premiered on September, 10 1993. Over the course of its nine-season run, the influential series went from breakout sci-fi favorite to massive global hit, and became one of the most successful television dramas of all time. 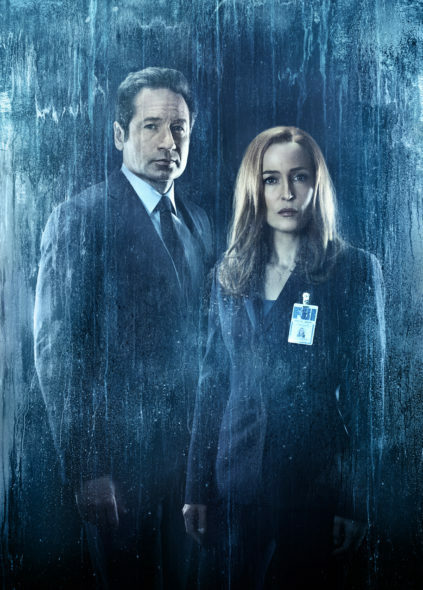 The show, which earned 16 Emmy Awards, five Golden Globes and a Peabody Award, follows FBI special agents Mulder (David Duchovny) and Scully (Gillian Anderson), as they investigate unexplained cases – “X-Files” – for which the only answers involve paranormal phenomena. What do you think? Are you still a fan of The X-Files TV series? Did you enjoy last season’s revival? Do you plan to check out The X-Files season 11 when it debuts on FOX in January? Let us know, below.